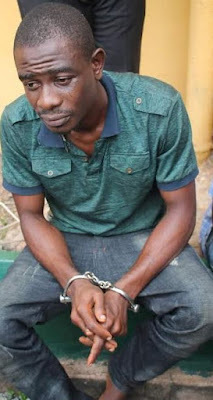 The Abia State Police Command have arrested a suspected armed robber who was released from prison for a case of kidnapping three months ago. Detectives attached to Central Police Station Umuahia while on early morning foot patrol today, June 6th, intercepted the suspect, Joseph Etim, of Amuzukwu Umuahia in possession of a big ‘Ghana must go’ bag. A thorough search of the bag revealed assorted provisions, cosmetics and wines. Upon interrogation, he confessed to have broken into one of the POWA shops along Finbars road Umuahia. Spokesperson for the Command, DSP Geoffery Ogbonna said that this same suspect was arrested, arraigned in December 2016 and remanded in prison custody but was released in March, 2017 when the complainant declined to prosecute the case.